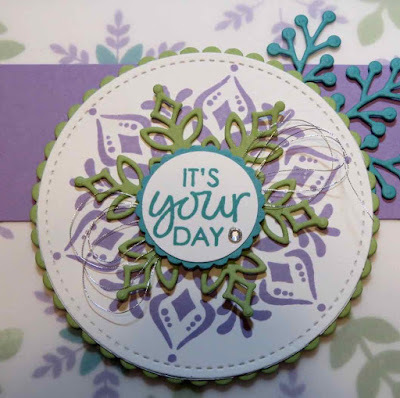 Do you want the Happiness Surrounds stamp set yet? 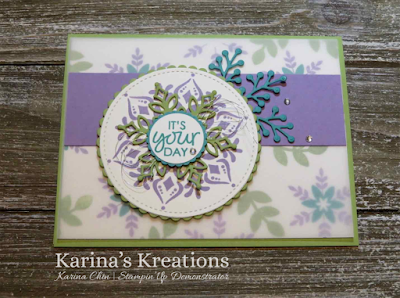 You can make so many beautiful cards with this set and coordinating snowfall thinlits dies. I created my own designer series paper by randomly stamping the images on Whisper White card stock with Highland Heather, Pear Pizzazz and Bermuda Bay Ink. I placed a layer of vellum card stock over top to soften the look. I used the Stitched Shapes framelit dies and Layering Circle Dies to highlight my large flower. Here's the supply list for my card. Please click on a picture below to place an online order.